If you like romance novels, this is one of the really good ones. If you don’t like any romance, then please stay away from this book. This book deals with harsh subjects (bullying, abuse etc.) and romance. 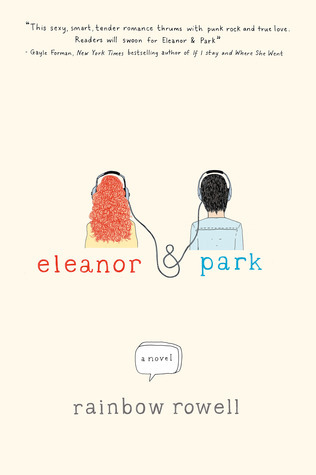 I really liked Fangirl by Rainbow Rowell, so I was curious about Eleanor and Park by her, even though it is a book screaming romance. But I really did not like it. The characters are fine. Sometimes they left a bit to wish for, but overall they are pretty real characters. It is also helped by the two POVs. Eleanor feels like one of those alternative kids. She wears whatever she has, without caring too much for how she looks. I am a girl like that (although my fashion sense is better). She makes friends with two brown girls and she tries to keep up with her inhuman situation her family lives in. I think she has courage, but I can’t agree with her not going to the police with some situations. However much you want to protect your mother or siblings, an unregistered gun in a house with small children. Park is sometimes the most shallow one of the two. Even though he is very nice, he yells at Eleanor the first time they meet, just because he gets annoyed with the situation. I don’t understand why someone would not have a bit more patient with a new person. Also, he does not fight for Eleanor when she wants him to leave her at her uncle’s house at the end of the book even though he does fight with Steve when he keeps calling Eleanor names. All that aside, I do think Park is a really gentle and caring boy. The book deals with very serious subjects, bullying, abuse, etc. This makes the book very serious and not a light read. The story happens over the school year, which sometimes drags the story a bit on. I would have liked it better if it was a little bit faster in its pace. I do have say as a side note, I have been bullied for most of my school years and I really have a problem with bullying. Also I do not like romance novels a lot, but I did try to write this review as unbiased as possible. This entry was posted in Book Review and tagged Abuse, Book Review, Bullying, Contemporary, Rainbow Rowell, Romance. Bookmark the permalink.